As a new project manager, you will eventually have to write a project report. There is just no away around it! As an experienced PM, you may have already done thousands. Fortunately for all of us, MS Project has features and functions that are designed to help you get your reporting duties done in as few words as possible. Using data already entered into your project plan (charts and graphs) is usually better than long winded essays anyway. However, when you examine your options on the Report ribbon, you might not see an option that produces the report you had in mind, or you may feel that none of the “canned” reports (of which, there are many) are quite what you were after. In this situation, one is naturally drawn to the cake labeled New Report, which sits on the ribbon. You may think, “Yes, that’s what I want, a new report…it has to contain this and that, and everything has to look like this.” Upon closer examination, you’ll find that the options are simply Blank, Chart, Table, and Comparison. Oof! 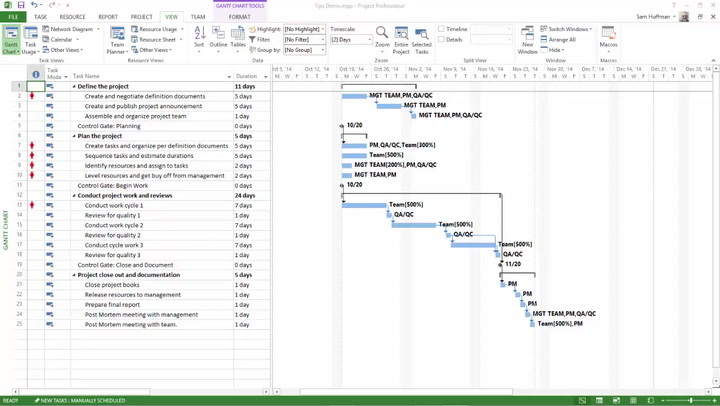 Opening the Project Overview template gives us something to play with and/or tear apart in order to understand just how reports are constructed in MS Project. If we understand the elements of a Microsoft Project report, we can then assemble one on our own using the myriad of MS Project tools provided. Borrowing from another literary metaphor, pull back the curtain on a specific report template by going to Report ribbon > Dashboards > Project Overview. Let’s discover the wizardry behind creating a custom report. Just as Dorothy did in the Wizard of Oz, we are about to find the real way to Oz, without all the smoke and mirrors. Now that the original Project Overview is preserved, we can safely modify the copy without worry. The first thing that you might have noticed is that when the report is open and you select an element (the title, MY NEW PROJECT OVERVIEW, for example), the ribbon changes to display two sets of tools: one for designing the element and one for formatting the element (see Figure 2). This is the wizardry to understand: clicking on any element inside the report brings up different tool sets depending on what is selected. This becomes obvious as soon as soon as you click on the first element (in this case, the report’s title). You can see that what you are editing is just a simple text box that has tools available to make the text and the box look the way you want it to. Textbox tools (and all others) resemble those in MS Word, Excel, or Powerpoint, but are not quite the same. Even so, you should have no problem using them to change the formatting. Use the bounding box to adjust the size of the element and position it anywhere on the report page. Where are the boundaries of the report page? Inquiring minds want to know and we’ll get to that next. Figure 3 shows the page boundaries of your report, as well as the text boxes, tables, and chart elements. It is important to note here that Microsoft was very sloppy when creating report templates. Elements overlap page boundaries and even each other, which is a custom reporting faux pas! The good news that that although you’ll need to go ahead now and fix all the overlaps and boundary problems, you can do so by just selecting an element and dragging it around. And, use the bounding box to size the elements. The next mystery to uncover is how tables are used to display data fields from your project plan. The tables shown in Figure 3 all have columns whose headings contain project data fields. For example, in the tables sitting under the text boxes “MILESTONES DUE” and “LATE TASKS,” the column headings should be familiar: Name is the Task Name field and Finish is the Finish field (as found in your Gantt chart view). Other field names should be familiar as well, such as Start, Duration, % Complete, etc. The Field List exposes a list of all the project data fields that you can select from, and subsequently you can tick off the one you want to fill a column of any given table. In our example above, we could untick “Finish” and then tick “Start” to change that column to be filled with Start dates instead of Finish dates. Easy peasy. You can also tick multiple fields in the Field List to add new columns that will be filled with any data you have in your plan. Go ahead and give that a try! So far we understand the mysteries of editing text boxes and tables, but what about that Chart element that is highlighted in in Figure 3? Clicking on the chart boundary also brings up the Field List, and double-clicking on any other bit of the chart brings up the relevant tools used to format and build charts. Here is where things might get muddled if you are unfamiliar with building charts in either MS Excel or MS Word. For those not used to charting within MS Office products, we’ll cover that more fully in Demystifying Custom Reports (Part 2), but for now we can say that you put together charts just as you do tables, but with Charts you are using that same Field List as well as a complete set of charting tools, such as Format (Chart Area, Axis, Data Labels, Plot Area, Plot Lines, etc. ), Chart Filters, Chart Styles, Chart Elements, and so on. I’ve found the easiest way to learn how to chart in MS Project, is to just take a chart and tear it apart using the tools offered. Don’t worry, you can’t break anything here. Figure 4. Important charting tools – go ahead – play! The trick to remember is that the tools change (and become visible) only after you select an element in the customized report that you are constructing. Experimenting with the custom report you’ve started is a great way to learn more about the available tools and their functions. Note: other basic elements like Images and Shapes can be added, but you probably already know how to do that from using MS Word. So far we have successfully gone down the rabbit hole of custom reporting. We’ve learned how to create a new report by taking the existing report “Project Overview” and making it our own, as well as editing the key elements for any report that we might find: Text Boxes, Tables (filled with project data fields), and Charts (also filled with project data fields). Armed with this knowledge, you should now be able to open up any other report, such as one of the canned templates for Upcoming Tasks, Cash Flow, Resource Overview, etc. ), and tailor it as your own. You are even experienced enough now to go back to the Report ribbon, select New Report, and build one from scratch! Remember those mysterious options of Blank, Chart, Table, and Comparison? We’ve covered all but Comparison, and I’ll explain that now. Clicking Comparison just gives you a new report with two default charts side by side, along with a text box element for the report title. Note: as with any of the elements discussed, if you don’t need it, just delete it! Text Box Edit shape, change shape, shape fills, outlines, and effects. Format shape or text, rotate shape, and WordArt styles are also available. Table Field list for task and resource data fields, standard design and layout tools (as found in MS Word), text direction, arrangement tools for overlapping elements, and WordArt styles are available for text. Chart Field list for task and resource data fields, design tools for changing the look of the chart (to include all the standard chart types found in MS Excel), shapes within charts, format axis, format data series, format data labels, format values, filter values, and WordArt styles are available for text. Next time we venture down this rabbit hole, we’ll explore more fully the underworld of charting within Microsoft Project, as well as learn how to organize data and print stunning reports for the boss. In the meantime, feel free to ask questions or make comments below. Great article: I almost feel guilty that I am not using Power BI… this is so powerful yet easy. Quick question. I am using project professional 2016 stand alone no server. I am adding three custom fields to the schedule. When I try to build reports I don’t see these custom fields anywhere. Any reason? I have try to create same scenrio in ten line schedule also and same problem. Hi Rick! So where are you looking…and what are you looking for? For example, are you in the Field List sidebar and looking to select CR? Assuming you used Text1 as an empty field “slot,” and that you renamed it from Text1 to CR, then you should see CR (Text1) in the Select Fields list. But there are so many scenarios… best to send the file (if you can) to info at pcatww dot com.